Feb. 14, 2011 - PRLog -- Attorney Marie T. Jablonski is pleased to announce the relocation of her general law practice from her present location in Chicopee, Massachusetts to her new office located at 29 Elliot St., Springfield, Massachusetts effective immediately. 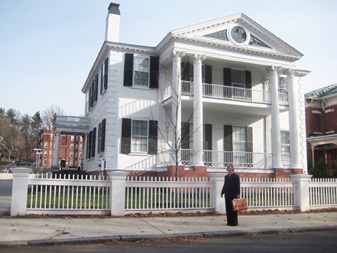 Attorney Jablonski’s new office is located in the historic Alexander House, one of the oldest surviving structures in Springfield. Built by Simon Sanborn in 1811, the former residence was moved in 2004 to make room for the new federal courthouse. The new location provides plenty of free parking as well as improved accessibility to meet client needs. Jablonski’s decision to move her business to Springfield was easily made when space became available in the historic Alex¬ander building in late November. “I was born in Springfield, I live here, and I am committed to its growth. I had considered a number of possible locations. When my brother, Stephen Jablonski, partner in Jablonski DeVriese Architects, told me of the available space, I was very excited. Everything came into place very easily. Not only will I be working in my home town, in one of its most beautiful historic buildings, in the neighborhood where I went to school years ago, it also will be great being near my brother,” says Jablonski. Stephen Jablonski has lent his talents to many Springfield historic preservation projects including museums, libraries and The Barney Carriage House, and is also located in the Alexander building. Attorney Marie T. Jablonski has a solo law practice which provides legal services in the areas of family law, real estate, and probate work. She is a certified mediator and also provides mediation in family law matters, as an alternative to the traditional adversarial method in a family law court case. A 2002 graduate of Western New England School of Law and recipient of the 2009 Pro Bono Publico Award from the Volunteer Lawyers Service and the Hampden County Bar Association, Marie volunteers with several local community associations including the Human Rights Committee of Work Opportunity Center in Agawam, the Chicopee Chamber of Commerce, the Polish Center of Discovery and Learning in Chicopee and Bethany Assembly of God Church, where she is a member. Your Business Brand: Build It and Protect It!